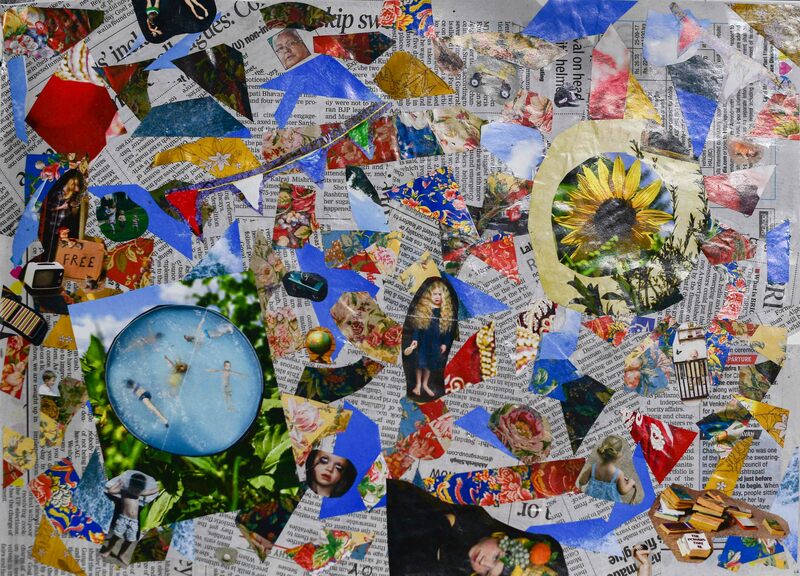 Collage as art form for experimentation is the aim of DP 1 student Beatrice Maurilli. To address this challenge, Beatrice immediately turned to her sketchbook and began literally cutting and pasting images from magazines, newspapers, and abandoned pieces of paper with bits of paint and pencil sketches. A common approach to expression through the visual arts is to begin directly with hands-on. As you can see in the image above, Beatrice’s method of expression is to rely on primary blue, red, and yellow hues combined with shapes like simple triangles and circles. This isolation of mostly geometric shapes, figures, and randomly selected floral patterns might seem haphazardly placed but when accompanied with explanation Beatrice draws her audience in through story telling. She begins to explain her fascination with the daily travels that any student might notice if your focus is out the window of a travel bus or car as you drive through the streets of Pune. Her art seems to center around the Have’s and Have not’s and the wide gap of socio-economic status that we all notice from time to time. 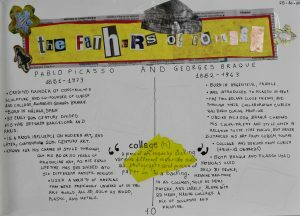 Beatrice explains that her approach to creative thinking as applied to the art form of collage is literally to begin cutting and pasting simultaneously as she thinks about the relationship between life and imagery. The images she finds are woven together with the sights and sounds that she is most recently faced with. Her artistic intention at this stage is easier to discuss and talk about than it is to visualize, nevertheless her original idea for expression is coming together as a talking point. To help with the development of concept and techniques, Beatrice relied on the fathers of Cubism, Pablo Picasso and Georges Braque. 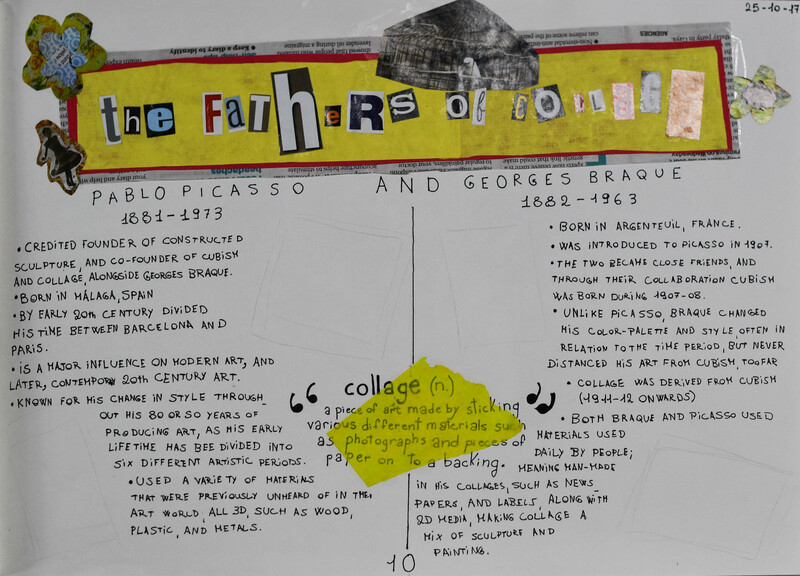 Noted for introducing collage to the fine arts Picasso and Braque were just the beginning of Beatrice’s newly found appreciation for the art form. John Stezaker an English artist born in 1949 is the artist introduced by Beatrice and she explains through her process portfolio that it is his photographic collages that most interest her and provide inspiration for her work. 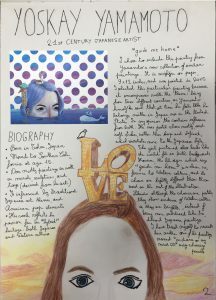 If you see Beatrice on campus here at MBIS ask her about the progress of her work.